Files checked by content after all files are transferred of after each file? the files will be checked after all of the files have completely been transferred or will each file be checked after the single file is transferred (what might cause different check results - I assume - because the file might still be kept in the cache and the file being in the cache is checked instead of the source file on the drive, is that right? The center column shows the status of the content scan, which will usually run per file as they finish transferring. We try to avoid caching, but the OS has ultimate control over this. Drivers and the OS can still serve cached information to any program, even if the program requests a fresh copy. Our scan is as reliable as can be achieved, although if you are dealing with buggy drivers a fresh system restart would (likely) clear any troublesome caching if that is occurring for you. The center column shows the status of the content scan, which will usually run per file as they finish transferring. We try to avoid caching, but the OS has ultimate control over this. What does "usually" meant? There is a choice? Wouldn't it be better to check the content after all of the files are transferred because of the caching? is it the right option to check for it and the only option doing it? a fresh system restart would (likely) clear any troublesome caching if that is occurring for you. After each file being transferred? There are some shortcuts to specific content scans. 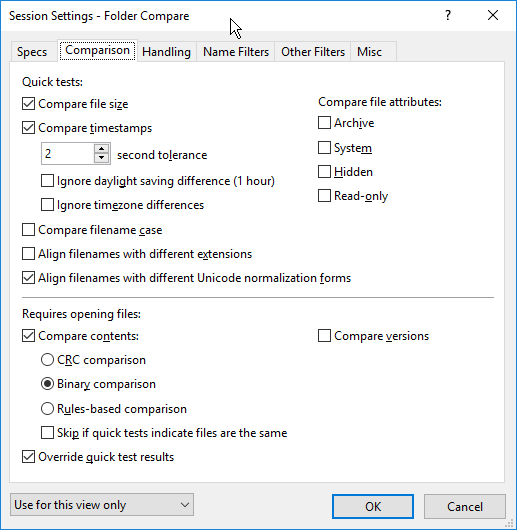 If the files are of a different size, then the binary scan results are instantly populated since files of a different size cannot be binary equal. BC4 is multi-threaded so the number of connections can also impact when different jobs (copy or compare) are run. The center colum Hour glass will appear between files that are actively comparing, and the results will populate once it is complete; the progress bar will show which files are copying. The restart should clear most caching (this is all external to BC4), so you would reboot before performing the scan. If you think this is a scenario you need, you would disable the content scan during the first transfer, finish the full transfer, restart, then compare. However, this is an extreme. You would only perform this if you do not trust the host OS to correctly report your files. I'm not recommending the restart, but addressing your concern about caching and expressing that even if we report binary equal that there is a small chance the results could be incorrect if dealing with a buggy device or the OS cache unexpectedly serves the incorrect information. For example, some CDROM drives will keep it's cache if the next disc has the same internal serial number (something that is against CD standard, but possible to do during a duplication), and a restart would help here to freshly compare the second disc, but if you are hitting this it is better to fix the core of the issue and set unique serial numbers. OK, thank you very much, I will try to consider the information.